As a holiday destination, Megève exudes old-world charm; the small village is huddled around the old church, a medieval tower and the town hall. Among the narrow Megève streets and small squares are antique shops, crowded bistros and old-fashioned butcheries and bakeries. Unlike many French holiday resorts Megève has remained fairly exclusively French; the upper crust make Megève their winter home when the mistral forces them to leave the Riviera. Furs are the coats of choice for strolling past the trendy Megève boutiques and dining at its excellent restaurants. For skiers, Megève is fairly uninspiring but Chamonix and Argentiere are within striking distance, providing very exciting skiing opportunities. Megève is fairly uninspiring for experienced skiers, but world-class resorts Chamonix and Argentiere are within striking distance, and so it still makes a good base, especially if there are non-skiers in the group. Megève itself has 186 miles (300km) of marked trails with 81 lifts, two snow parks and a half-pipe for snowboarders. The facilities are all very good, and snow coverage is generally reliable, with snow cannons on hand to make up for Mother Nature's occasional failure to provide. Megève is the shopper's paradise of ski resorts. There are a number of chic boutiques and antique shops along the narrow cobbled streets, including high-fashion shops and art galleries mixed with ski equipment stores and souvenir shops. There are a number of high-end restaurants in Megève, with more than a few Michelin stars between them, but there are also some cheaper options offering simple French and international fare. There are a few lively bars and clubs in Megève that make its nightlife fun and relaxed. There are three main nightclubs in the centre of town, and a number of bars that stay open until nearly 4am. Bars and clubs in Megève tend to be highly-priced, and even when there is no entrance fee drink prices can be exorbitant. 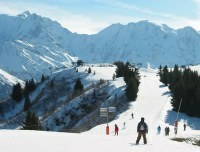 Many purpose-built ski resorts don't have a wide variety of activities available off the slopes. However, Megève has more than its fair share of diversions, including a weekly market, and sleigh rides and horseback riding. There is a casino with clubs and shows, a spa, and an ice rink to entertain non-skiers. Megève is not a budget ski resort and prices can be high. Advanced skiers will find few challenges on the slopes in the immediate area. Traffic to the resort gets very congested in peak season.